And that’s it my friends! 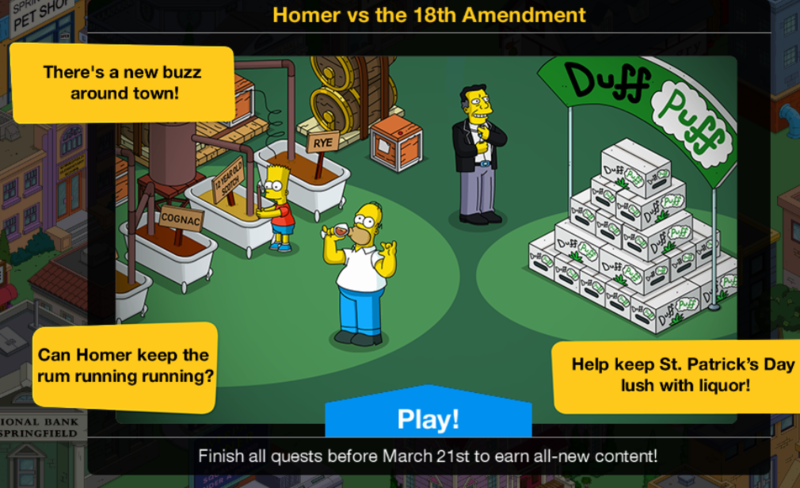 All there is to the Homer vs. 18th Amendment mini event main questline. 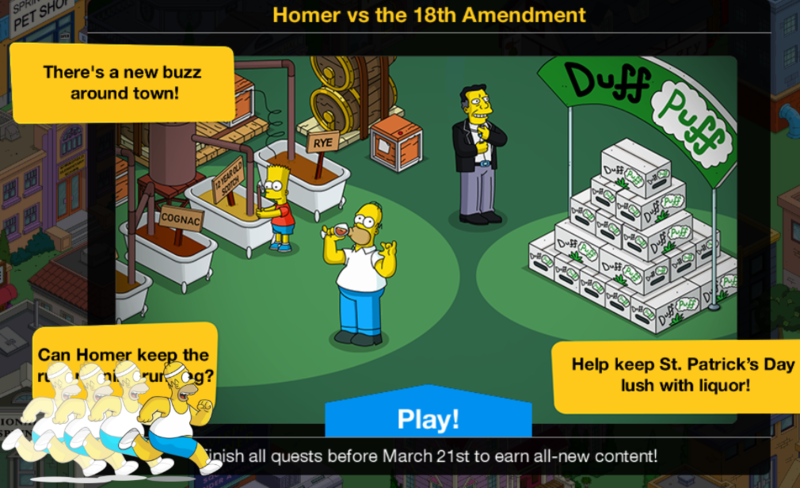 This entry was posted in Homer vs 18th Amendment, Tips and Tricks, Updates and tagged Duff Float, how do i get howard duff, Howard Duff Give Out Samples Task, Pass Puff Puff Questline, Tapped Out Mini Event, Tapped Out Tips and Tricks, The Simpsons Tapped Out, TSTO Addicts, TSTO Homer vs 18th Amendment Update, TSTO Tips and Tricks. Bookmark the permalink. I am not fond of the trend of “only new premium characters are relevant to this event”. I should have to buy a skin to use Duffman? There’s no role for Barney? C’mon, man. Hmm, another decoration that should be in the Simpsons cellar (the bathtub brewery). I really want them to add an update that would allow us to go inside the house and place objects there but I know that’s a lot to ask. It would mean adding another dimension like Krustyland, make all the objects and maybe the small map rotation 180 degrees to allow more decoration options and animate new interior tasks for the family. And find a system to switch floors too. Since we need four of them, cellar, ground level, first floor and attic. But since I don’t thing it would need more than four « chunks » per floor (the big squares you can buy on your map), I think the game engine could handle options like that fine. Was awarded the Canada Crossing and it was going to take 4(?) hours to build and I couldn’t send characters to collect drinks until then. So I spent 2 donuts to rush the build. Is anyone having this problem? Can’t send Duffman on any jobs via Job Manager at the moment. He’s not involved in the mini event as far as I can see. He is involved via lady duff. You need 2340 drinks in total to get all the prizes and send H. K. Duff on the 8 hour task for the final part. 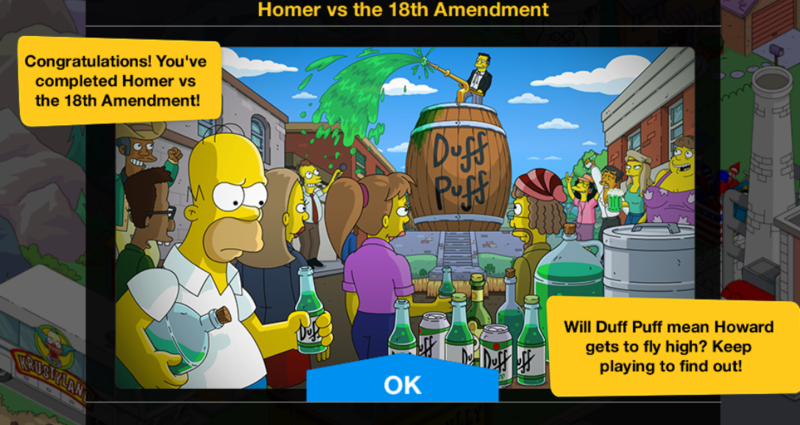 If you don’t have Lady Duff, Meathook and Ramrod or Hooch City (building gives out 20 drinks every 4 hours or 60 drinks every 12 hours if you can collect 3x a day); you need to send all the characters 39 times in total to get the prizes with the event ending on the 21st March. If you log in and send characters to earn the currency at least 3x day (180 per day) then you should get the final prize on 20th March (assuming you started the event on Wednesday, if you send the characters at least 4x day (240 per day) then you should get the prize on the 17th. If you have Lady Duff but not Meathook and Ramrod; you need to send all the characters at 33 times for the whole event to get the prizes, if you log in and send the characters at least 3x day (219 per day) then you should get all the prizes on the 18th. If you can send the characters 4x day (292 per day) then you should get the final prize on the 16th (or even 15th). If you have Meathook and Ramrod but not Lady Duff, you need to send all the characters 27 times to get the prizes, if you log in and send the characters 3x a day (270 per day) then you should get the last prize on the 16th. 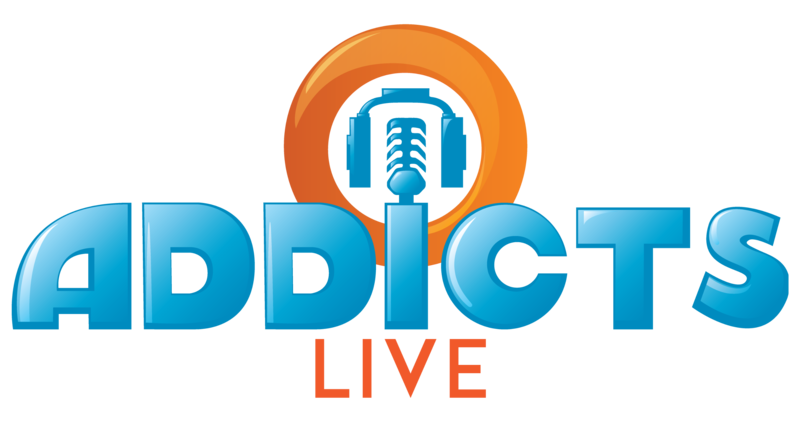 If you send them 4x a day (360 per day) then you should get the last prize on the 15th. If you have Lady Duff, Meathook and Ramrod; you need to send all the characters 24 times in total to get all the prizes, if you log in and send all the characters at least 3x a day (309 per day) then you should get the final prize on the 15th. If you can send the characters at least 4x a day (412 per day) then you should get the final prize on the 13th. Was having trouble tapping or moving the “unruly crowd”…did neighbor visits and when I came back it worked fine. Moved them out to the biker bar…seems like a good fit😁. PS…the “where’s my water?” issue for the last two rows seems to be fixed, was able to put my lake back where it belongs. I cant tap the unruly crowd or move it now I have placed it, must be a glitch. I went to Krustyland, visited neighbors then closed my game and re-started it. THEN, I as a lot,tap it. THEN I was able to tap the crowd. I already have the Diff Party Bus, so if I get Lady Duff does that mean I’ll get a second bus? Also is Lady Duff a skin or a separate character? It’s a skin, earns beer and yes you’ll get a nother party bus (2.25%bonus) … I have 3 now. They used to not be unique. 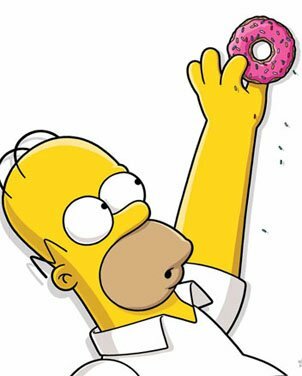 If I remember right, I think I got them during tap ball for 40 donuts each…. Others have mentioned problems with the Unruly Crowd. I’m told to tap ithe Unruly Crowd 3 times. Nothing happens. I can select and move the Duff Puff stand, but not the crowd itself. I purchased another crowd, with a bonus, and it too is ‘wonky’, it auto selects where it wants to be placed. I can store it and attempt to move it, but it won’t allow me to simply select and move it. hey, why cant Cetus earn 10 Alcohol? He literally brews moonshine already! Thanks for the post! I think this content is fantastic. I love St Patrick’s Day and the Hell’s Satans episode was great. I was surprised at how quickly it was released after the big event, but that seems to be a thing EA does, now. Will we see Duff McShark? Also, the Beer Baron episode is amazing. Rex Banner was the first premium character I ever bought – I believe actual money was involved. I wish we had a day or two off but at least it is a mini. I noticed the other day, after the update Birch Barlow no longer has spoken lines. This new update minimised my tap radius, hindered my ability to put characters on jobs reduced the money mountain reduced the railyards capacity all of which were at maximum. Why did you do this?!! This has become a common thing lately – contact EA to rollback your game to the last time it was working properly. It can be a process, but needs to be done if you want to fix these problems. Contact EA ASAP!! This happened to me last year and they had to reset my game…the sooner you contact them the better! I waited hoping it was a temporary glitch and ended up losing a lot of progress and even characters that I earned/bought. I’m still trying to get back the items I lost. This shouldn’t still be happening to people all these months later and I wish you the best! Good luck!! For iOS try turning your phone off and on. Then go to Settings>iTunes & App Store >Updates. Then slide the green toggle off and then on. This has worked for me the last three events when they didn’t show up in my App Store updates. Good luck. You can’t get Lady Duff if you already have Duffman. It’s stupid. She just showed up with the bus – for $50 donuts! Yay!! I’m surprised that neither Otto nor Barney have any tasks in this event. They’re in the store bundles/mystery box, but they aren’t being used in the storyline at all? another bundle that I can’t buy because I already have one of the itens…. Hey, uh, I’m level 16, and is there a requirement to actually start this event? I’ve not received this questline at all since updating. So anyone else have a mission for pieman show up? My games completely wogged out and started giving my event notifications from back in 2016 till now. For every minor event we have had. Didnt know if pieman was a glitch or he really in connected to this new st patricks day event. I had this happen several months ago…contact EA immediately!! They will probably have to reset your game to when the issues started. Hope yours turns out better than my experience did–good luck!! This is exactly what is happening in my game. 1st contact with EA rolled my game back which fixed it temporarily, then it happened again. 2nd contact told me he did something to fix it and to wait 24 hours before I logged in again. I waited, it wasn’t fixed. 3rd contact had me leave an email. Has anyone else had anything work to fix this? I thought it was strange that Meathook and Ramrod were included in the Homergeddon event, since they were a perfect fit for it. 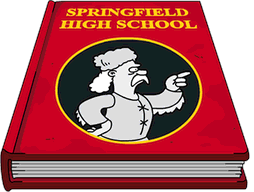 There is also the Damaged Simpsons House skin for the Simpsons House from this mini event that can be added to the collection of Damaged skins from the last event which includes the Power Plant, Lard Lad (though it is called Ruined Lard Lad), Courthouse and Jebediah Springfield Statue. Yeah. I think EA probably had considered these characters and skins, etc for the last event, but for whatever reason didn’t release them during the event. Go figure. Those bathtubs bring me back to the episode where Abraham and Homer made love tonic in Abraham’s bathtub. A classic in my book.